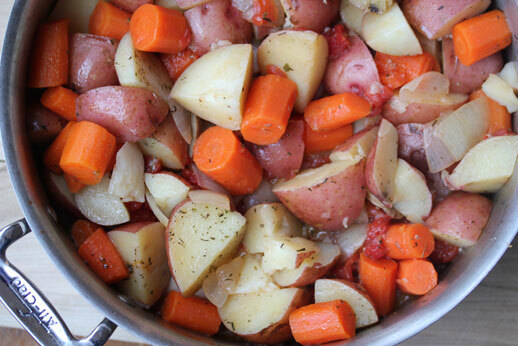 Hiding under all these perfectly tender red potatoes and carrots are a couple of chicken thighs. I promise. This recipe is a happy accident. I meant to make this in the slow cooker. Except I didn’t get it started in time. I hadn’t written it onto my daily planner. And I forgot to set the slow cooker on the counter the night before. And it wasn’t until 2:30 pm that I figured out my error. But thankfully there was still plenty of time to get it made…just not in the slow cooker. The Dutch oven was the only option. Braise the chicken thighs, while cutting up the potatoes and carrots…then let it slow cook on the stovetop. Same delicious result, with minimal fuss and minimal dishes! Add the olive oil and balsamic vinegar to a large Dutch oven. Turn on the heat and then brown the chicken on both sides. Season both sides of the chicken with salt and pepper. Add the potatoes, carrots, onion and diced tomatoes over top of the chicken thighs. Pour about 1 cup of water over top. Then sprinkle the Italian seasoning plus a little more salt and pepper over the top. Add a few drizzles of olive oil over the top. Bring the liquid to bubbling, then reduce heat to medium low and cover tightly. Let cook for 1 hour to 2 hours, or until chicken is cooked through and potatoes and carrots are fork tender. Serve Italian Chicken with Potatoes out of the stovetop, as is. No side dish necessary! This entry was posted in Dutch Oven, Recipe. Bookmark the permalink. So, hypothetically, if you were to do this in the crock pot, how long would you put it on for? would you still brown the chicken first if you were using the crockpot? Holly – No, I wouldn’t brown the chicken first when putting in a slow cooker. I usually only do that for slow cooker roasts, to seal the juices in. It’s not necessary with chicken. I think I have most of these ingredients on hand. Do you think red wine vinegar could work in place of the balsamic, in a pinch? Wonderful Marlene…so glad you enjoyed it! Yummy! made with boneless, skinless tight so I didn’t brown them. Love all ingredients in this meal. Gotta cook it!!!! This looks wonderful. I will have to try it this week before I have my cervical fusion neck surgery next Wednesday. Probably won’t be able to lift it for a while after that. Delicious recipe. I modified by adding more veggies – celery, sweet potatoes, yellow pepper; spices – three cloves of garlic, three teaspoons of Italian seasoning, one teaspoon of salt; tomato paste, hatch chili vinegar (instead of balsamic), chicken broth instead of water (which I used to deglaze the pan after browning chicken), threw it all into the slow cooker and stirred then cooked for two hours on high and three on low and it was amazing! I should also note that I browned the chicken, removed from oil then sauted onions for five minutes, added garlic for one minute and then the rest of the veggies for five minutes, tossing to coat with the oil. After removing veggies, I deglazed pan with the broth and added everything to the slow cooker pot. The chicken broke up on its own so it made a sweet-savory, hearty stew. I would definitely make again! Yes! Finally something about architecture model. you are really a just right webmaster. The website loading speed is incredible. The contents are masterpiece. you have done a fantastic job in this matter!